I finally saved up enough dough to get the Tallboy bars for my 1200C. Now I need to know what cable kit would be best. Or would getting the HD parts be the best route? Barnett makes quality cables to your specifications as does Magnum Shielding. Just let them know what length you want along with black/stainless steel and they'll make 'em up for you. 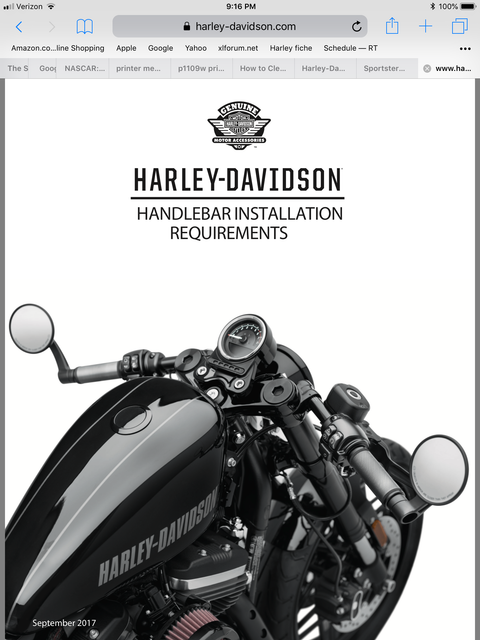 Info about the Harley cables and brake lines that can be used to install Tallboy bars starts on page 24 of the PDF at the link below. I just went with all Harley (diamondback silver) cables and braided brake line when I got the mini apes. I also decided while I was at it to replace the stock riser and speedo housings with the OEM ones from a 72. If you want to do this you will also need the right indicator bar, but be sure to get one for a 2013 72 as the 2014+ ones use CAN bus. All fits into place and I can actually read the speedo now instead of having to look down, so I can look ahead like a real biker, instead of looking down like I've just been sent to the naughty corner for allegedly pinching that other kid's Mars Bar whilst high on craft glue. My clutch cable came with a complementary nick on the coating, so Harley replaced it under warranty with one which had a complementary nick on a different bit of the coating, so Harley won't replace it because the defect is "too small. Less than a year later, and now I am tempted to take this up with the government watchdog.